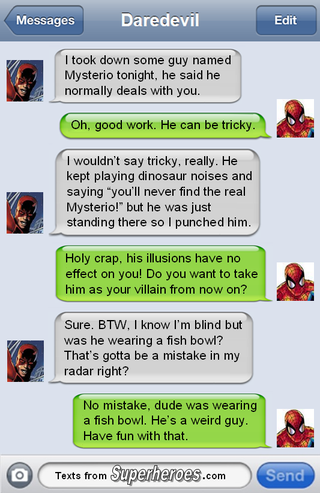 In honor of the new Daredevil show that i won't be able to watch legally (Yes Netflix, Portugal is a real country), today I leave you with a image from Texts From Superheroes. Follow the link for more, they have a daredevil special today. How is everyone this fine morning? EDIT 2 : yep, it's confirmed. I won't be able to post anymore of this. So.. Any europeans want to pick up the responsibility?